Martin Carey and his Land & Sky campsite at famous Glastonbury Festival has since Bike 4 Cambodia was found back in 2010 been one of our biggest supporters. During 2013 and 2014 Land and Sky kindly donated the proceeds from one of their tipis rented out during the festival. After discussion with Martin and his Team they decided that the money from 2014 should go towards a new Toothbrushing project and the school picked for the project is called Rorangleur school. The school has 300 students and it is located just outside Kampong Cham. 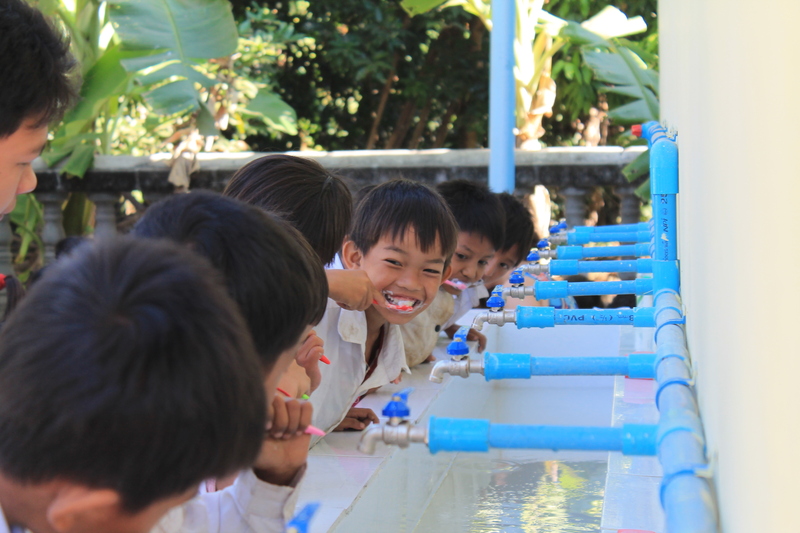 In our attempts to provide as many Cambodian students as possible with good dental health the kids in Rorangleur school also get the chance to see the dentist and from now on they will get fluoride varnish applied to their teeth a few times a year. It is interesting to see the kids at Rorangleur brushing their teeth. In the beginning they didn’t know what to think about it but these days they tend to run out to the sink as soon as its time and they do enjoy it very very much.